•When I was 16, I was sent t a small private residential school for kids with various kinds of special needs. There were only 14 students and I was the oldest one of the lot. Shortly after the school-year started, one of the teachers left. So the people who ran the school suggested that I help out by teaching math to other kids and helping them learn to ride horses in return for my room and board. So, at 16, I was promoted from special ed student to special ed teacher, even though getting an actual teaching certificate took another 15 years. •When I was 21, I took a job in a large state institution. There were more than 5000 children and adults with developmental disabilities who lived there. It was a horrible place. For awhile, I thought that I could make it better. It did get a little better as time went by, but not much and not because of my efforts. It took me ten years to figure out that the place was a lot more successful in making me a worse person than I could ever hope to be at making it a better place. •I came to the University of Alberta in 1982 to train teachers to work with children with multiple disabilities. 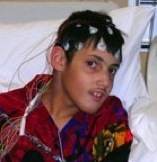 •Our son, now a young man, has severe and multiple disabilities. Spending a couple of decades as a parent-caregiver is also a part of who I am. Pretty much every day, Dave teaches me something. •I think there has been one thing that I have done pretty well, which has shaped my career. Most of the time, I have been a good listener.